It’s that time of year once again. As Fall sets in around the Los Angeles luxury homes, the city is bustling with people looking for a good slice of pumpkin pie to sate their craving for a first taste of the season. It’s a trickier task than a first glance might suggest — a pumpkin pie has to be crafted with just the right combination of ingredients, and baked with some holiday know how that really brings out the spirit of the Autumn season. Thankfully, there are more than a few places around Los Angeles that can provide your fix, and we’ve listed several here for you to check out this year. Luckily, we needn’t look very far to find an assemblage of some of LA’s finest. Timeout has already done some digging, and put together a rather substantial list of spots around town that have set the proverbial mold for doing pumpkin pie right. Let’s take a deeper look at what these top spots are all about. The Larder, located on San Vicente Boulevard, is the brainchild of Suzanne goin and Caroline Styne. They claim to bring “a trio of concepts under one roof,” those being the full service dining room, the marketplace (where you can buy merchandise and other goods), and their bar with craft cocktails and artisinal wines. They’ve received more than their fair share of press, and Styne herself is a James Beard recipient and noted restauranter with an eye for keen dishes and amazing eatery setups. Many dishes at The Larder impress, and their huge pumpkin pies (which can feed up to eight people!) are no exception, hitting the right notes on their flaky crusts and nailing the delicious filling with a mix of sweetness and spice. Porto’s traces its history back to one amazing woman — Rosa Porto. The skilled, Cuban cake maker was famed for creating sumptuous desserts in Mazanillo, and when her family came to the United States, they continued the tradition and delighted their newfound California customers with amazing cakes galore. You can now find their bakeries across the city, and you’ll be treated to deliciousness with every bite of their fine offerings. 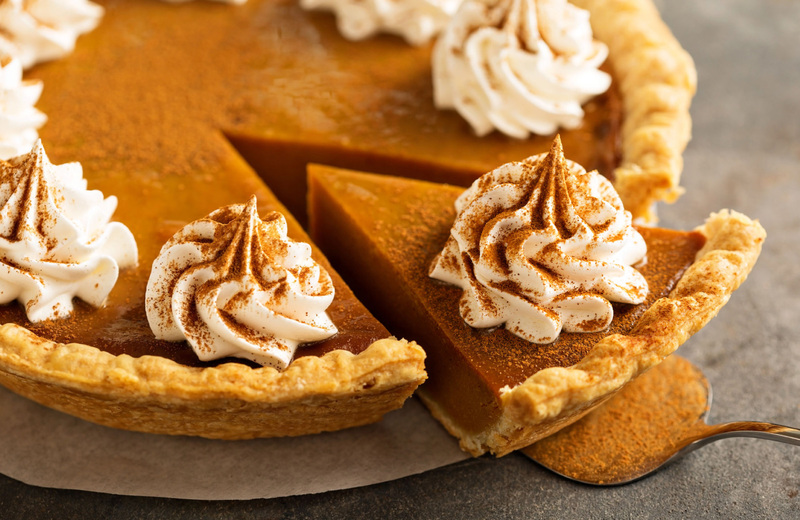 From the pumpkin pie specifically, you’ll get the creamy center and light, delicious crust you’ve been hoping for, and those aren’t the only pumpkin-themed treats they have for you to order. Their menu is complete with fall pastries, including their famed pumpkin cupcakes, pumpkin muffins, pumpkin cheesecake, and dutch apple crumb pies. Be sure to check out the whole variety for a true taste of holiday delight. You’ll find the Pie Hole when you venture over to the Downtown Arts District (along with several other locations around town), and with a name like that you’d probably expect that they know a thing or two about how to make a great pie. You’d be correct in that assumption, of course, and when the seasonal menu rolls around to Fall, you can find Moe’s Pumpkin Pie, a veritable delicacy, featured prominently in the list of offerings. It’s delicious, obviously, and when you pair it up with a nice cup of coffee, the flaky crust goes down as well as any other treat you’ve tasted. Sweet Rose Creamery is another great bakery you’ll encounter with spots all around Los Angeles. Now, you should note that their main specialty is ice cream, and their homegrown story stresses the fact that they are an LA original that does ice cream like no other in town. What goes better with a slice of pie, though, than some cold vanilla? They combine their ice cream with the pumpkin pie to create a famed pumpkin ice cream pie that’s out of this world. This is the kind of treat you can only catch during the fall season, so be sure to head to one of their five locations to check it out. This French-style eatery is known for many things — their bar, their cafe, the elegant restaurant — but the bakery isn’t something you should discount in the slightest, even if it’s sandwiched between all those other options. When Fall comes knocking, pastry chef Margarita Manzke breaks out the top shelf ingredients to mix into a marshmallow-topped delight that’s creamy on the inside, flaky on the outside, and a joy to eat any time of the day or night. You might well describe Cafe Gratitude as whimsical, playful, or fancy-free, but they take baking desserts seriously. Blending the “finest organic ingredients” with a philosophy of “loving life” and “accepting the world,” they create a range of pastries that taste like they’ve been crafted with an otherworldly sense of wholesomeness. Their pumpkin pie is no exception, as it exemplifies that commitment to being plant-based and “good for the earth.” If you’re looking for a pie that’s made with a unique twist (but doesn’t skimp on the flavor), you enjoy what they have to offer. Officially titled Superba Food + Bread, this eatery is all about “living well” and eating well while you’re doing it. As such, they offer some unique takes on many popular dishes, breaking the rules so that you can sample treats that take the joy of food to a whole new level. Case in point is their pumpkin pie, which is so delectable and over-the-top that you just might want to get two of them to savor the flavor. If you’ve got a bit of culinary know-how yourself, apartments like Eighth & Grand make it easy to take on the role of head dessert chef. Of the many fine features this amazing community touts, the elegantly designed kitchens — replete with quartz countertops and stainless steel appliances — making cooking in style an easy task. Be sure to check out more of what Eighth & Grand makes joyful, and make this your prime spot for luxurious living in the heart of DTLA.